Want an easy no bake dessert that tastes great? Then you'll want to try this delicious no bake Cranberry Cream Cheese Tart that is dressed for the holiday season. It starts with a graham cracker crumb crust that includes spicy ginger cookies. 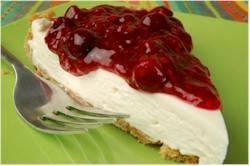 Once the crust has chilled, we fill it with a no bake, creamy smooth cheesecake-like filling. And the finishing touch is a sweet and tangy Cranberry-Raspberry Sauce. This is such an easy dessert to put together as it uses a graham cracker crumb crust which is, by far, the simplest of all the pie crusts. If you have problems with getting the right crust consistency, there is a test to see if you have the right amount of crumbs to melted butter. Once you have mixed the ingredients together, squeeze some in your fist and if they hold together, you have the perfect crust. To liven up the flavor of the crust with a subtle ginger taste, I have added some crushed ginger cookies along with the graham cracker crumbs. You can use either homemade or store bought ginger cookies. Once the crust is made and left to chill in the refrigerator, the next step is to simply mix the filling ingredients together. The filling is then poured into the crust, covered, and left to chill in the refrigerator several hours or even overnight. While this tart is excellent with a medley of fresh berries, it's lovely with a Cranberry Raspberry Sauce. This sauce has a sweet and tangy flavor and is made by cooking fresh (or frozen) cranberries and either fresh or frozen unsweetened raspberries with sugar and a little lemon or orange zest. If you like you can also add a splash of cherry brandy (Kirschwasser or Kirsch). The thickness of the sauce depends on how long it's cooked. And keep in mind that the sauce does thicken as it cools. I like to serve the sauce separate, alongside the tart, so everyone can have as much, or as little, as they like. If you have leftover sauce, it's great spread of scones, biscuits, or toast. Or you can even use it to fill tart shells for these Jam Tarts. Graham Cracker Crust: In a large bowl mix together the graham cracker crumbs, ginger cookie crumbs, and sugar. Add the melted butter and stir until combined. (You can also combine the ingredients in your food processor.) Press onto the bottom and up the sides of a well greased 8-9 inch (20-23 cm) tart pan with removable bottom. (A spring form pan can also be used. Press the crumb mixture onto the bottom and about one inch (2.5 cm) up the sides of the pan.) Cover with plastic wrap and place in the refrigerator to chill (at least 15 minutes) while you make the filling. Cream Cheese Filling: In the bowl of your electric mixer, or with a hand mixer, beat the cream cheese until smooth. Add the sugar and beat until light and fluffy. Scrape down the sides of the bowl and then beat in the vanilla extract. In a clean bowl, beat the whipping cream until stiff peaks form. Gradually fold or beat the whipped cream into the cream cheese mixture. Pour the filling over the chilled graham cracker crust and smooth the top. Cover and refrigerate several hours or overnight. Serve with the Cran-Raspberry Sauce. Cran-Raspberry Sauce: In a large saucepan combine all the ingredients. Cook over medium heat, stirring often, until the sauce thickens and is bubbly. This will take about 10 minutes. Remove from heat and let cool. (Note: taste and add more sugar as needed.) Cover and store in the refrigerator for a week to 10 days. Makes about 2 cups (480 ml). Serves about 6 - 8 people. Preparation time 25 minutes.